Red Band rocks. As a candy company, they just seem to “get it”. 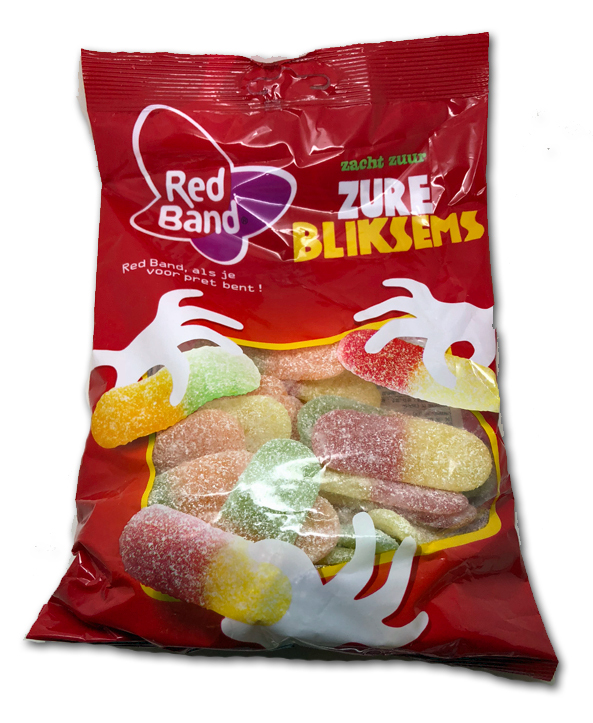 I’ve tried many varieties by them over the years, from the fabled ‘sour keys‘ to half licorice/half gummies — they’re always high quality, and usually somewhat distinctive tasting. This time, we got gifted from our buddy Susie, and immediately, I was sure they’d be great at the very least. Zure Bliksems. Translated, that means “acid lightning”. Yeah. These are that badass. Imagine if you will, an ultra sour gummy-one that’s not quite Toxic Waste level, but definitely in the Sour Patch Kids range, but with a less artificial flavor profile. That’s how these start. Mine might have been stale, as they were very firm, and I adored that. Firm, sour, and fruity. After a moment or two, the sour level fades as it always does, but not to nothing-it stays at a strong tart level for the duration. My thoughtfully developed chewing method was to bite off one half, in order to pretend that I had more candy than I actually did. A distinct, fruity chew follows, and there’s just something sublime about it. I tried so hard to pinpoint the flavors, but I couldn’t. In my younger days I might have dinged them for that, but now…I don’t really care anymore. I just care that it’s tasty, and these are not only delicious, there’s something different about their taste that makes them stand out. Immediately recognizable as…these…but not as the fruit they’re trying to emulate. Now that’s distinctive! 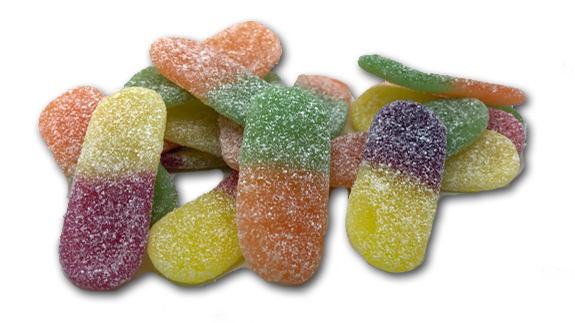 Look, I’m not gonna sugar coat this: if you like sour candy, you need these. They make almost all the offerings we get here in the states look like amateur hour. And while they’re not super easy to find out and about, a tub of them IS super easy to find on Amazon, and it’s even prime. I just bought one, so that should tell you something. There are these too, which I’m guessing are similar if not the same.